SUNY Broome has a dedicated group of staff and faculty that are available to assist students in distress. This multi-disciplinary team reviews the information about the student in distress and takes appropriate action to best ensure the student’s well-being, the community’s safety, and the student’s success here at SUNY Broome. If you, or someone you know, is in crisis, please notify the Student of Concern committee by contacting the Dean of Students. Reportable incidents include sexual misconduct and student conduct violations, as well as other types of student crises. The new Dean of Students site includes an updated flowchart for the reporting process, updated Title IX information, as well as a Campus Climate Survey. 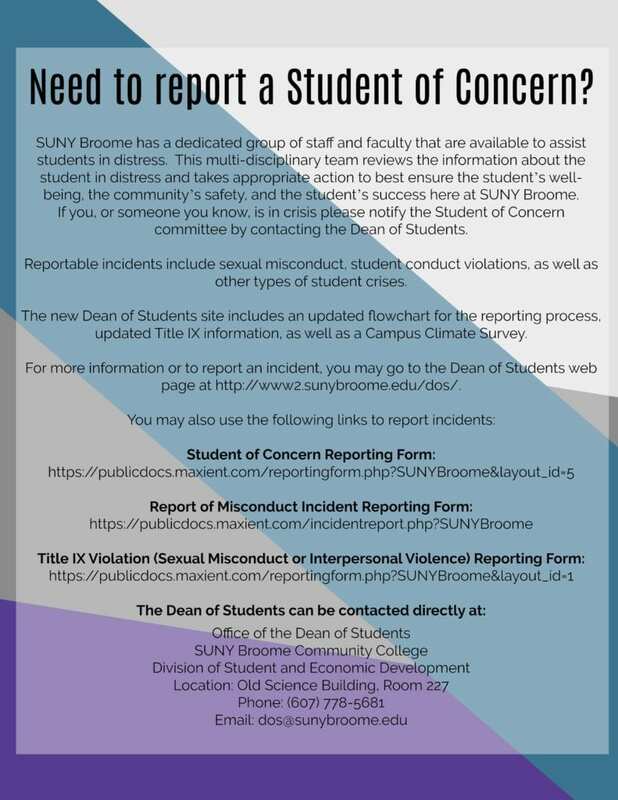 For more information or to report an incident, you may go to the Dean of Students web page at http://www2.sunybroome.edu/dos/.